About 1904 a group of Weed townspeople gathered on Sunday evenings for a service of prayer and song in a pine grove near the present church location. Later efforts to form a church resulted in an association with the Presbyterian Church. On November 22, 1906 the Rev. O.H. McCullagh, Pastor at Large for the Presbytery of Sacramento, organized the Mt. Shasta Church in Weed. The church building, located on a lot near what is now known as Davis Street, was completed in 1907, a manse in 1908. By 1920 a growing congregation, facing extensive repairs on the small building, decided to build a new church on the lot of the present church. On November 20, 1921, the new church was dedicated. The Rev. Anderson Crane accepted the ministerial call on January 8, 1920 to the Mt. Shasta Church. Sorrowfully, Grace Presbyterian Church, as it is now named, burned to the ground early on April 9, 1982. Thanks to excellent insurance coverage, work was soon started on a new church. By November 20, 1983, the new building was completed. An Open House on Saturday, November 19, was widely attended, followed by a dinner. Communion was celebrated on Sunday, November 20. The Rev. Randy Yenter preached the first sermon followed by a coffee hour. Grace PC celebrated 100 years of ministry on September 29, 30 and October 1, 2006. On January 1, 2013, Grace church withdrew from the Presbyterian Church (USA) and joined the Evangelical Presbyterian Church. This move was made, after much prayer and discussion, to align the congregation with a denomination whose beliefs more closely hold to the teachings in holy scripture. Later in 2013, the church name was changed to Grace Community Evangelical Presbyterian Church. Once again, the church was destroyed by fire during the Boles Fire on September 15, 2014. The fire destroyed over 100 homes, two churches and several businesses in Weed. Many other homes, schools and businesses were damaged. 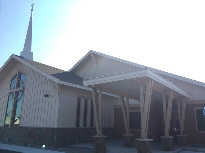 Plans were made to rebuild the church and groundbreaking was held in the fall of 2015.